Acting Interior Secretary David Bernhardt is blasting his Democratic predecessors and targeting a former National Park Service director as he touts improvements to the department's ethics bureaucracy. In a pointed and acutely timed missive to Interior's 70,000 employees, Bernhardt declared the department's "ethics infrastructure" had been "badly neglected for far too long." He pinned blame on the Obama administration. "Sadly, our organization's ethics challenges were part of a mess that we inherited," Bernhardt wrote in a departmentwide email on Friday. "The last decade of the Inspector General's reports read like an avalanche of ethical misconduct. No Bureau is exempt from criticism." Ethics problems have bedeviled the Interior Department across multiple administrations. Obama's team, for instance, inherited in 2009 a Minerals Management Service whose troubles dated to the George W. Bush administration's Interior; Bush's first deputy Interior secretary, J. Steven Griles, went to prison for obstruction of justice. Bernhardt's "ethical culture" message includes a commitment to boost the number of Interior's career ethics officers, and it comes at a doubly delicate time for him and the department he leads. Bernhardt holds his current position because former Interior Secretary Ryan Zinke felt compelled to step down in the face of multiple inspector general investigations, which Zinke said imposed an undue financial burden in defending against "false allegations." At least two of the Zinke-related IG inquiries are known to still be underway, involving land dealings in his hometown of Whitefish, Mont., and a Connecticut tribal casino decision. Zinke was also the focus of myriad other IG inquiries, which cumulatively clouded his reputation, even if the final reports cleared him (E&E News PM, Jan. 31). Besides turning the page explicitly from the Obama era and implicitly from Zinke's time, Bernhardt's memo also shines a spotlight on his own leadership and willingness to play offense while he's a top contender for nomination as Zinke's successor. Last Tuesday, Bernhardt's schedule included two midafternoon meetings at the White House for reasons that were not publicly specified. The next morning, Bernhardt's schedule included a call with Sen. Lisa Murkowski (R-Alaska), the chairwoman of the Senate Energy and Natural Resources Committee. "I haven't heard anything from anyone about timing or new names. It's just that we've been continuing to do business as usual," Murkowski told reporters Thursday. Much of Bernhardt's week was devoted to all-staff meetings with various Interior agencies. "By the end of Fiscal Year 2019, we will have doubled the number of career ethics officials that the previous Administration hired in its entire 8 years," Bernhardt wrote Friday. These new employees include a new designated agency ethics official; an alternate DAEO; a financial disclosure supervisor; an ethics education and training supervisor with the Departmental Ethics Office; and deputy ethics counselors at the National Park Service, Bureau of Land Management and other agencies. Two weeks ago, Trump announced plans to nominate veteran investigator Mark Lee Greenblatt to fill the long-vacant position of Interior inspector general. Greenblatt is currently the assistant inspector general for investigations at the Commerce Department (Greenwire, Jan. 14). As an example of what he termed a "cavalier approach to ethics compliance," Bernhardt cited former NPS Director Jonathan Jarvis. A career NPS employee who's now retired, Jarvis has become a leading critic of the Trump administration's Interior policies. In a recent widely circulated op-ed, for instance, Jarvis declared that in the Trump administration, Interior's "doors were soon darkened by profiteers, big game hunters, oil executives, and climate deniers." 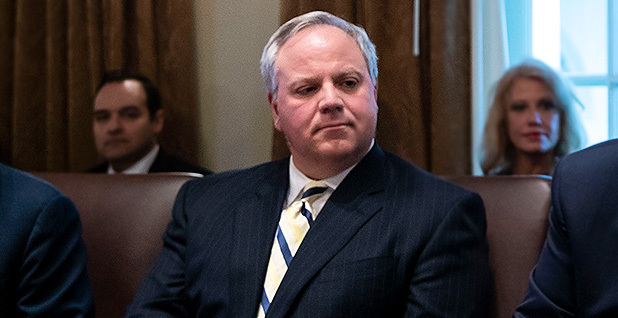 Appearing like a rebuttal, Bernhardt recounted in his ethics memo that Jarvis "essentially stated after being confronted with his own ethical violations and delivering an 'untruth' to the Secretary of the Interior, that he would have probably done the same thing again." "Such a view is precisely the opposite of what a culture of ethical compliance looks like," Bernhardt wrote. Twisting the knife, Bernhardt cited a link to the three-year-old IG report on Jarvis' actions. Because the link was missing in the email sent Friday night, a corrected version was sent yesterday. The 2016 IG report found that Jarvis had intentionally avoided seeking approval from Interior's ethics office before writing the "Guidebook to American Values and Our National Parks." Jarvis subsequently apologized to employees for an "error in judgment" (Greenwire, June 2, 2016). Jarvis could not be immediately reached this morning. "I have been focused on putting the pieces in place to dramatically transform a culture of ethics avoidance into one of ethical compliance," Bernhardt declared.